BENTLEY Systems of the US is set to release the newest developments in OpenRoads, one of its range of software solutions on which road agencies and departments of transport worldwide rely on as their design standard for transportation project delivery. OpenRoads represents the common technical capabilities underpinning the Bentley civil product lines of InRoads, Geopak, MXRoad, and PowerCivil. These capabilities include data acquisition for surveying, GPS (global positioning systems), and LiDar (light detection and ranging); associative and dynamic geometry with persisted design intent; and intelligent, 3D corridor modelling built upon and inheriting the common technology core in data acquisition, geometry, and terrain modelling, a company spokesman says. OpenRoads technology was further extended with the release of Bentley Subsurface Utility Engineering (SUE) last June. “SUE provides integrated engineering management of underground utility networks for water, storm water, gas, and electric services. It enables immersive modelling by empowering users to combine plan, profile, and cross-section views with innovative 3D modelling technology,” says the spokesman. 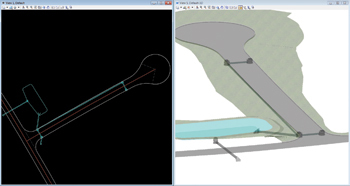 SUE’s additional provision of parametric design features includes fully dynamic rules, relationships, and constraints built into the modelling workflow. The net result is improved design quality with unique “optioneering” capabilities that allow users to readily create and compare design alternatives. Now, in the newest developments in OpenRoads, one of its primary new capabilities will be a further extension of SUE into subsurface utility design and analysis (Suda). Combining hydraulic and hydrology design and analysis with the 3D modelling capabilities of the OpenRoads brands fully integrates the design and analysis of drainage systems with the road network design. “Suda is built from the same technology as the proven analysis and design of the Bentley hydraulics and hydrology (Haestad) product line. Additionally, OpenRoads users will now be able to easily move their drainage designs into tools such as CivilStorm for more sophisticated and time dependent analysis, providing civil engineers with a total, integrated solution,” concludes the spokesman.